On this particular project, Intrax Consulting Engineers was tasked with the structural slab design of a single storey dwelling on a site with a soil classification of “P” due to the recently removed group of trees and an underlying soil class of H2. While we have touched on the potentially adverse effects existing trees can have on residential dwellings due to drying and shrinkage of soils in previous projects, it is also vital, and perhaps even more problematic, to consider the design approach when removing trees from a site with respect to swelling of soil that causes heave. Although we had the presence of basaltic rocks for this project, our data on neighbouring sites allowed us to make the judgment that these were likely to be floaters. This meant that there was likely to be a large swelling effect occurring in the soil due to the removed trees. In turn, leading to the specific design of the Hybrid Waffle Raft. The first step once the problem was discovered was to inform the client of the abnormal moisture conditions onsite that would mean an unconventional and unique design. This allowed open discussion between Intrax and AHB about the options and solutions that we could develop. We explored many options including; tying in piles forced below the nominated level of influence, an upgraded waffle slab, or an upgraded raft slab. It was critical to understand that the solution would not only be governed by what was the most cost effective, but rather it would be a combination of that and other critical factors such as; the performance of the foundation system, the preferences of the client, the ease of construction and availability of materials, the potential problems that may arise and how they could be mitigated. Communication was a key part of this process as it enabled us to find critical information such as the exact time of tree removal from the developer. Information such as this proved pivotal in our design as it meant some of the assumptions that would otherwise have been conservatively made could be eliminated. Open communication also allowed AHB to make cost estimations based on suggestions and help us arrive at a cost effective solution. We decided that we would develop a footing system that incorporates the deep internal beams of a raft with the internal ribs and a foam void formers of a waffle. 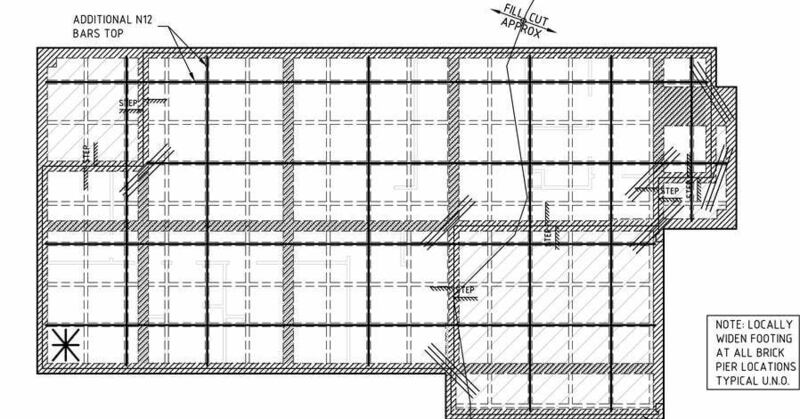 This above ground system with largely spaced beams combined the cost effective nature of a waffle slab with the deeper footings of a raft to create a stiff footing that would resist the imposed forces of soil swelling. The added benefit this provided for the client was that it would not be too different from constructing a waffle slab. Once the suggestion of a hybrid waffle raft was out there it was then up to us at Intrax to determine via computations whether it could work. The design process involved assessing the differential mound movement and making complex calculations using the SLOG software. Via a series of trial and error calculations and a feedback model, we were able to innovate and design the best solution for this problematic site. It is important to recognise that we live in a country with extensive regions of reactive clays and there is no one size fits all solution for slab design in Australia. In the past, we have specified other design solutions for sites with removed trees. These have included; upgraded waffle slabs including double waffle pod construction, upgraded raft slabs with deep footings and suspended polyvoid slabs on Katana Piles. With the Hybrid Waffle Raft slab, we now have another design option for problematic sites. We continue to innovate at Intrax and want our clients to rest assured that through open communication and our design methodologies we will arrive at a solution our clients will be satisfied with.